French President Nicolas Sarkozy has called for a speedy end to transport strikes against his pension reforms. His spokesman said the action ought to stop "in the interest of passengers" now that conditions for talks with the unions on the package had been created. Rail and bus services were crippled in Wednesday's action and more disruption is expected on Thursday. Germany is also facing rail disruption, as train drivers hold a three-day strike over a pay demand. Deutsche Bahn says it will not make a new pay offer, and drivers' unions have raised the prospect of open-ended strikes. The company estimates that 50% of regional trains will run on Thursday, but only 20% in greater Berlin and 40% in the Hamburg area. Hopes of a breakthrough in the French disputes were raised after Mr Sarkozy said conditions for talks had been met. "The president of the republic has always considered there is more to be gained for all parties in negotiation than in conflict," said Mr Sarkozy's spokesman David Martinon. 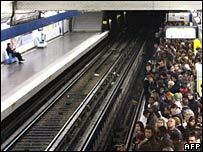 The strike began on Tuesday night and follows a previous walkout on 18 October. Prime Minister Francois Fillon was quoted by Reuters news agency as saying the government was outlining a deal to unions to stop "a strike that is... annoying millions of French people". Labour Minister Xavier Bertrand has been holding a series of meetings with unions, whose leaders signalled their readiness to make a deal. Jacques Voisin, head of the CFTC union, said after meeting the minister: "Let's not waste any time... let's negotiate." Bernard Thibault, head of the powerful CGT union, appeared to retreat from a previous demand for national talks by saying he would accept negotiations on a company-by-company basis. In Paris on Wednesday, more than 50,000 people took to the streets to protest against Mr Sarkozy's reforms. Other demonstrations were held across France. Nationwide fewer than a quarter of trains and only 90 of the 700 high-speed TGVs ran normally, while just one in five subway trains on the Paris metro and only 15% of bus services were operating. Across France, commuters were forced to find other ways to get to work - car sharing, cycling or roller blading along traffic-choked roads. Thirty-five of France's 85 campuses were disrupted by blockades as students protested against a law letting universities accept private donations and charge tuition. It is not clear if energy workers will continue to strike on Thursday, although they have voted to continue a blockade of the liquefied natural gas terminal at Fos-sur-Mer to Friday. The last time a French government tried to overhaul "special" pensions was in 1995 and it sparked three weeks of strikes that forced then-President Jacques Chirac to climb down. But the polls have so far broadly supported Mr Sarkozy, who says France can no longer afford to let some public service employees retire on a full pension as early as 50. Does French 'people power' rule OK? Will the French buy Sarkozy reforms?